Although a bag should primarily be of functional quality, the design of a bag is undoubtedly a key feature in fashion. The bags spring 2019 are mainly about the it-factor and not the trendy bags of recent years but the ones of early 2000s or 1990s. This includes bags that are often rather small in their size with prominent designer logos. For instance, Fendi’s iconic baguette bag is back in style. This trend goes along with the revival of the 1990s/2000s fashion of mini skirts, shirts, crop tops, pantsuits and low-waisted jeans. If you’re interested in buying a bag in a baguette style, second hand shops will be a great resource! I talked about the neon colors last week and oh boy’ are they popular for spring 2019. 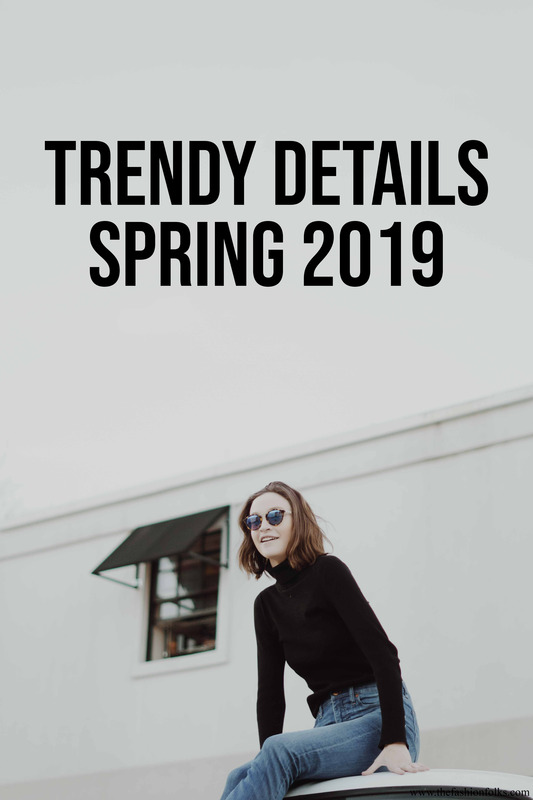 I don’t think this trend is only about embracing full statement-making clothing pieces, but also about paying attention to the details. A bag in a neon color, a pair of shoes or some jewelries. Focusing on the details regarding the neon colors is a great way of starting out with the trend. Read the full trend article here. I know I wrote about the sneakers last week, but boots this spring is definitely a thing! I’m not only talking about the OTK boots and how popular they are to pair with dresses, but also about casual boots for the daily life. At the moment, it’s extra trendy to do the boots in an animal print, preferably leopard or zebra. I think the boots are a great match with casual denim or bright spring pastels as they contrast the material and preppy colors. Another one of the trendy details spring 2019 are the jewelries. Earrings, necklaces, bracelets and rings should all be layered heavily this season! Keeping them in the same color is a key rule in making the look successful, but go for different models and lengths to keep it more dynamic! For instance, if you layer two necklaces, one should be shorter and the other one a bit longer! You could of course go for an Iris Apfel look (love that sort of statement! ), but keeping it more casual and neutral is the most trendy way of doing it this season! Who would’ve thought that the statement sleeves would still be a big deal two years after the trend was introduced? Well, the sleeves are definitely still a trend factor to count on. The statement sleeves spring 2019 are not about the bell or trumpet sleeves though but centered to ham sleeves (more or less). The core of the trend is to emphasize the shoulders á la the 1980s manner and through that create a look of an inverted triangle. Picking dresses or sleeves in this style will be favorable, especially if the fabric is more sheer! Boots and statement sleeves will be big this spring. Great tips dear! YES to the statement boots and statement sleeves!!! I’m loving the animal printed boots, particularly the snakeskin ones. I would definitely get a pair because though they’re trending, the fact that they’re in an animal print makes them that much more versatile and less dated in a few years. Statement sleeves are just everything I need these days. They do everything for you. You can go with a simple puff sleeved white shirt and pair of basic denim and your outfit will look amazing. The bags, on the other hand, I’m quite picky with. I love the Fendi one you’ve shown here, but the Dior one that has the logo all over in the fabric texture, I’m not too fond of. It looks too dated and I feel it just won’t last in terms of style. I hope you’re having a great week so far, beauty! I’m all about layering delicate necklaces right now- and you know how I’m LOVING the return of neon!